Prenuptial agreements have been around for a long time. Most of us know what these are, but in case you didn’t let’s talk about what that is. It can not only contain information about current assets, but can also describe what happens with debt that is brought into the marriage, and can also describe what might happen with future assets as well. Some interesting statistics around this idea of prenuptial agreements are written about in an article called “19 Interesting Prenuptial Agreement Statistics” which I have posted a link to in the show notes. Now remember this was written by an attorney so there could be some bias in this article toward the acceptability of a prenuptial agreement from a legal standpoint. He noted that it used to be much more prevalent for men to intiate a pre-nuptial agreement, but women are now closing this gap. 44% of singles report that having a pre-nup before entering marriage is a good idea. Of course this means a majority of 56% say it is not a good idea. 15% of people who have been through a divorce regret not having one in place. Of those surveyed, he says 62% of people say requesting a pre-nup agreement sends a negative signal. Over 50% of those surveyed said that signing a pre-nup would increase the chances of experiencing a divorce later on in marriage. An interesting story you may have seen recently centers around the CEO of Amazon Jeff Bezos and that he and his wife of 25 years are divorcing. They are worth personally around $137 billion dollars and have no pre-nuptial agreement in place. Their assets will be split but apparently according to law it does not necessarily need to be split 50-50. Again whether or not you thing a pre-nuptial agreement should have been signed is probably a debate for another time. 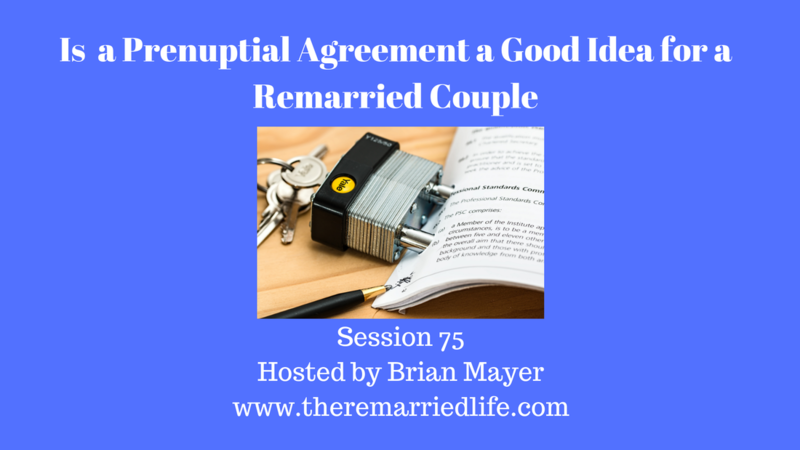 Since I am not an attorney, we will not be talking so much today about the legal aspects of whether or not this is a good idea but will more talk about the relational aspects and that if you do enter into one what might be some best practices to ensure your relationship is not negatively impacted. Here are some things to consider when it comes to a prenuptial agreement and the impact on your relationship. Work out existing trust issues first. These could be generated by infidelity or other betrayals that happened in past relationships, maybe the two of you came together as the result of an affair you had, or maybe there are other betrayals that have happened since you have been together. If any of these are the case, the chances of a prenuptial agreement going well are certainly reduced. Begin Planning and Even Finalizing the Pre-Nup Well Before the Wedding Date. Are you giving the prenuptial agreement enough time to marinate and be processed by you and your partner. If it is tossed at one of you days before the wedding or in one case I heard it was done the night before the wedding, then chances are increased that there will be issues. Are you drafting it together? Do each of you feel that you have an equal voice. This is a tough because usually the income, assets, or debts are disparate so there may be an inherent difficulty in feeling equal. Make sure everything is disclosed. If you leave something out and it comes up later this can also cause major trust issues. Adding Clauses like saying something about that you will exhaust all efforts like counseling etc. to save the marriage if the marriage hits a tough spot before considering divorce. Obviously proceed with caution when it comes to this idea of a prenuptial agreement because it can certainly have an impact far beyond anything financial.